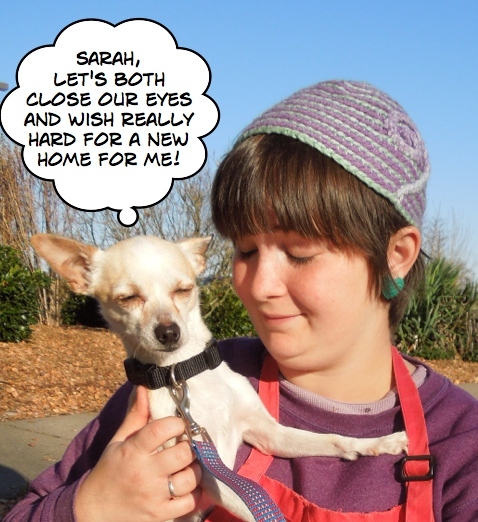 Emma asked me to start out this week’s post with a special message from all of the dogs currently awaiting their forever homes. 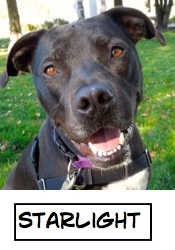 Emma is a Pit Bull Terrier mix who has been waiting patiently for her new people to find her since arriving from California on September 13. Before that she spent four months in another shelter. 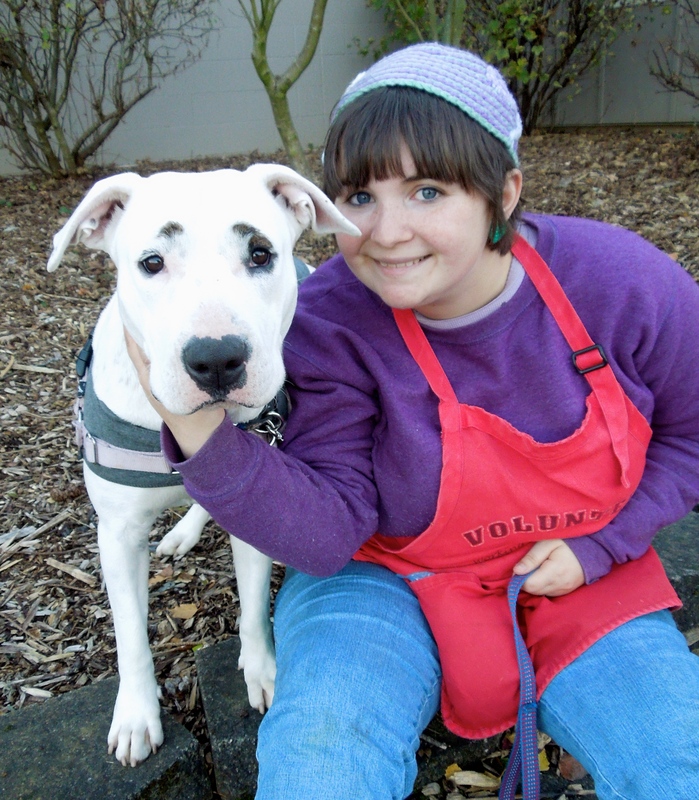 She has become a staff and volunteer favorite and we all hope she’ll find her perfect home before Christmas. Last Sunday was a busy day at WHS for me. First was play group and then there were 17 new dogs to photograph for the website! It’s always fun to spend some time with new arrivals. Seven of them were new dogs that S.T.A.R.T. brought to us from California. I’ll be introducing some of them to you in this post. 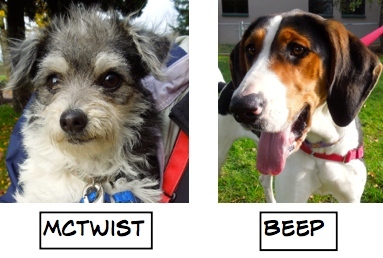 But first, there are some great Blog Dog adoptions to report. 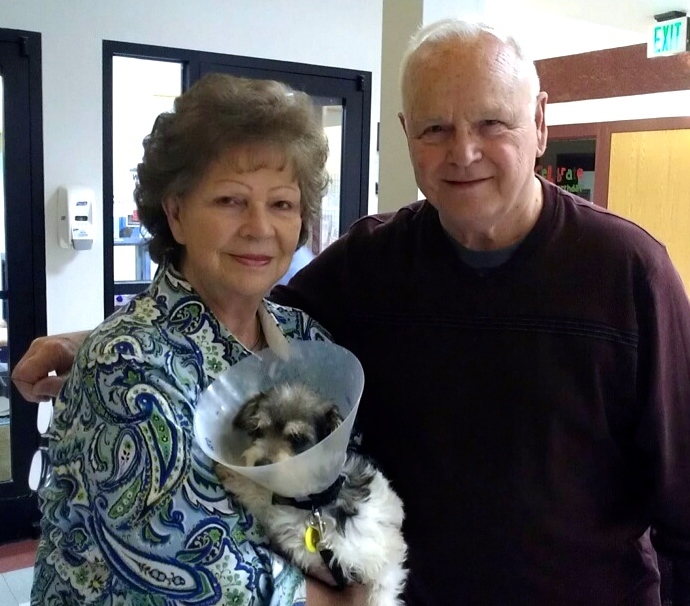 Staff sent me this photo of McTwist with his new family. I think he’s going to be very well taken care of! Play group was active with big and little dogs in their respective yards. Molly, a four-year-old Australian Shepherd/Australian Cattle Dog mix, spent some time hanging out on the platform with volunteer Bill. She’s a happy girl! 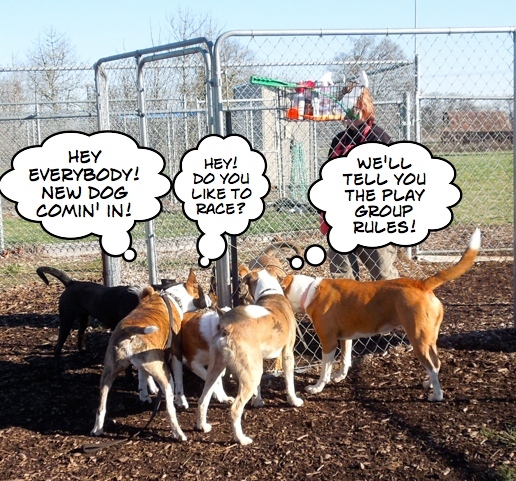 This is the usual scene whenever another dog arrives at play group. 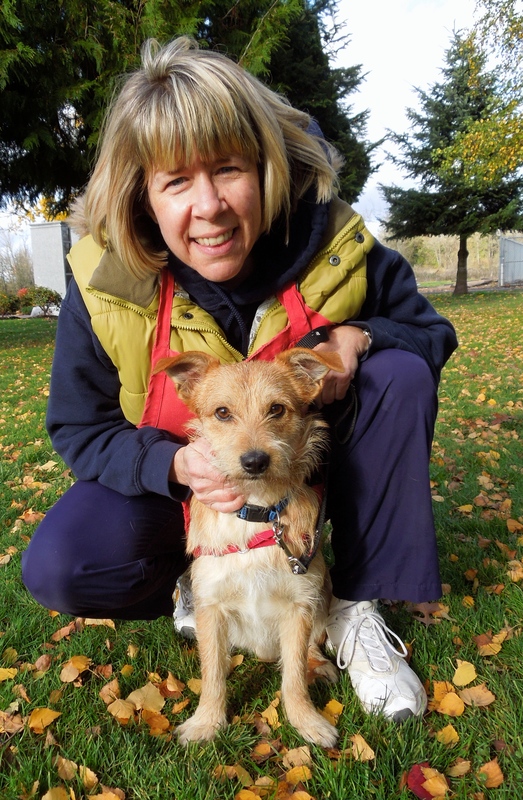 Volunteer Karen has joined our play group “staff” and brought Tanner (you may remember him as Rockstar) along to help. We were all so happy to see this WHS alumnus again. He made it clear that he wasn’t staying, just stopping by. 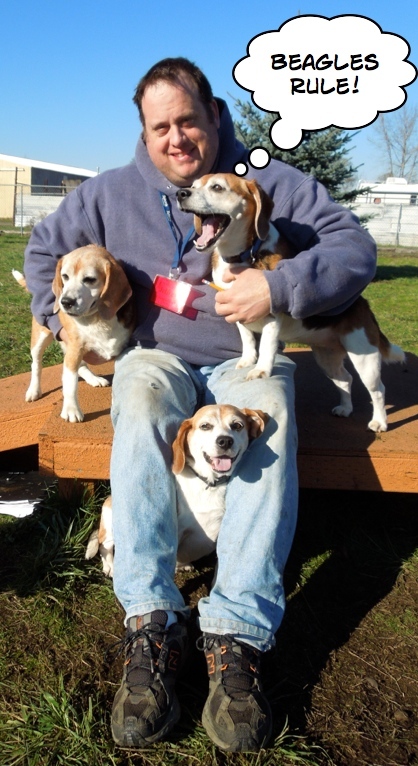 Meanwhile, in the little dog yard, the Beagles decided they were the bosses and announced their decision to Jeff. 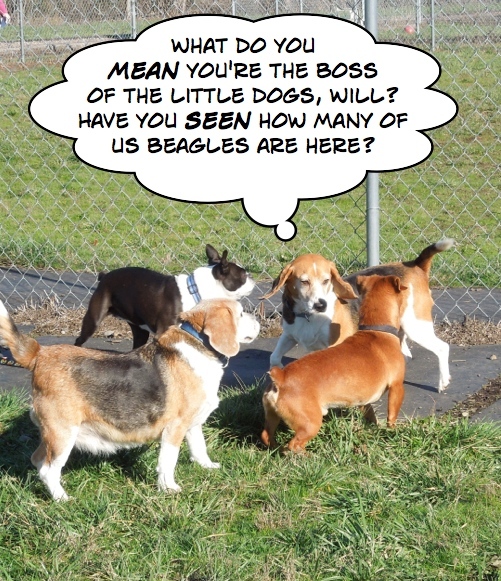 It seemed that Beagles were everywhere! 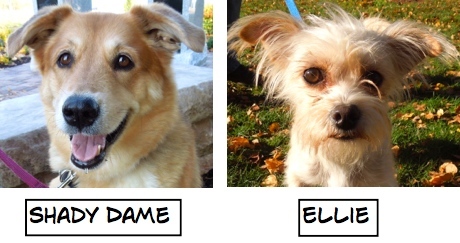 We currently have five of these fun little characters waiting for new families. They were the stars of play group! Will didn’t give up, however. 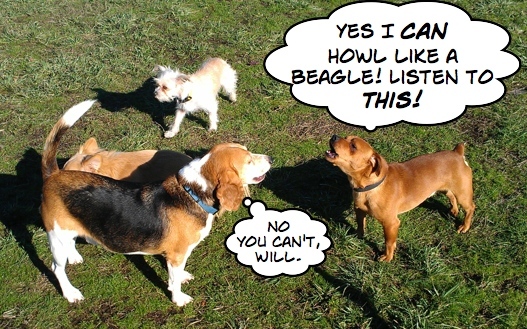 He decided to out-Beagle the Beagles! 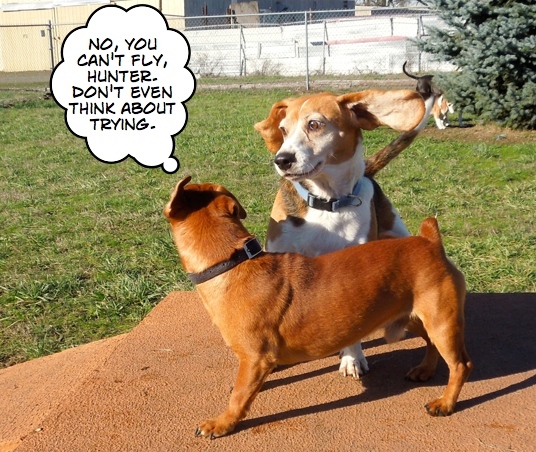 He even had some news for Hunter. 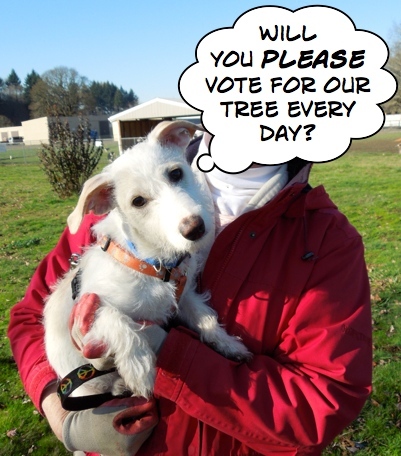 Before I get into this post’s featured dogs for the week, I want to ask my readers a big favor that could help win the animals at Willamette Humane Society a whopping $2,000! 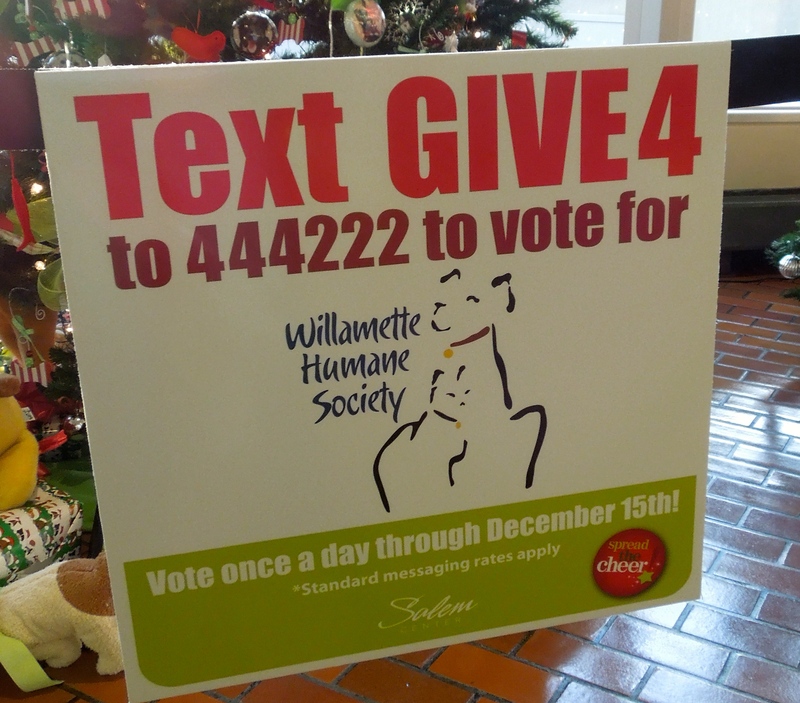 All you have to do is text “GIVE4” to 444222 once a day until December 15! 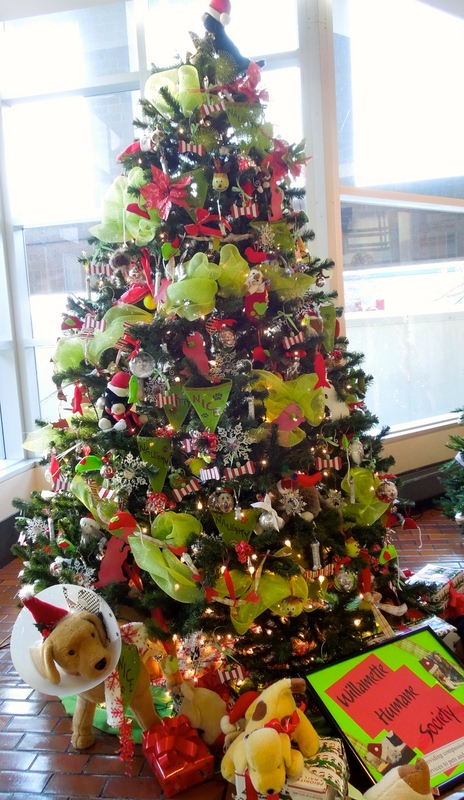 Each text is actually a vote for our Christmas tree located at Salem Center. Today I went to the mall to take a picture of our spectacular tree. Many volunteers had fun making the decorations and the result is amazing! 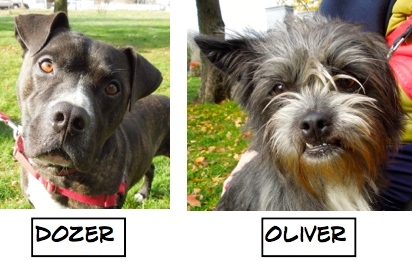 I met a lot of great new dogs on Sunday who can’t wait to be found by their forever families. Looking for a dog to match your active lifestyle? That’s ME! 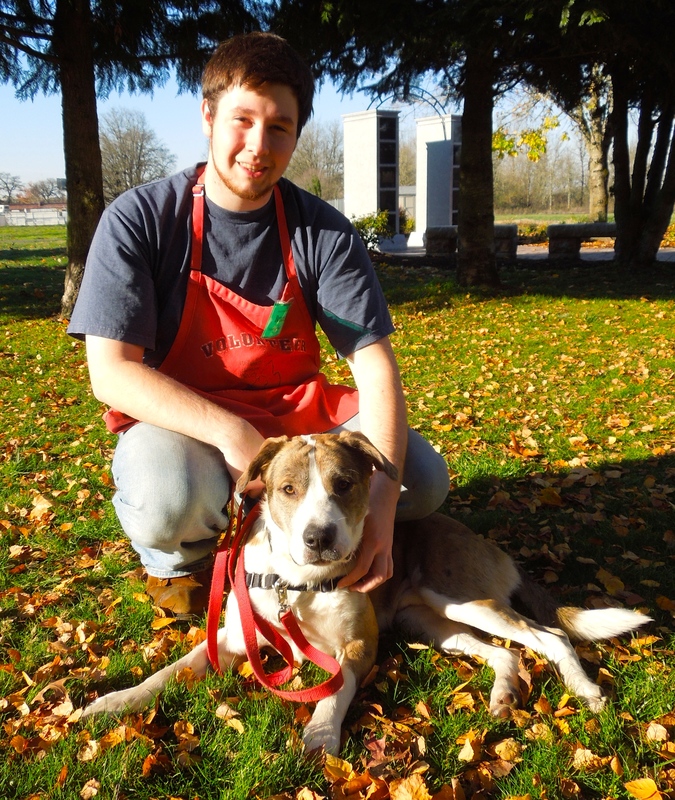 This is Kratos, a nine-month-old Australian Shepherd/Boxer mix who has it all. 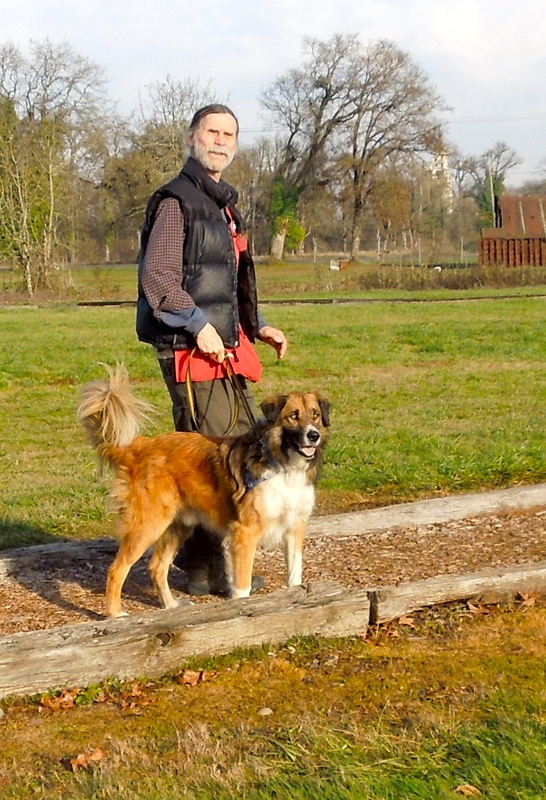 He is house-trained, and he has lived with two other dogs as well as children. However, he has a strong dislike of cats, so needs a feline-free home. Bruce fell in love with this handsome boy on the spot. He walks well on leash and took my treats politely. He’s going to be someone’s new very best friend. Want to add a little spice to your life? This little sweetheart is Clove. 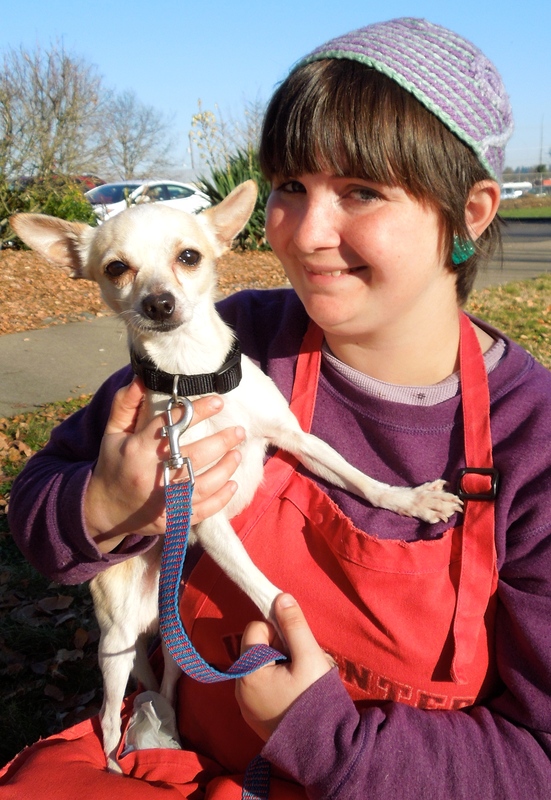 He is a two-year-old Chihuahua mix who is a very calm, slightly shy boy. He warmed up to Sarah almost immediately and loved sitting in her lap. He likes hot dog bits and being carried. If you’re looking for a cuddling buddy, an affectionate little friend, Clove may be the boy for you! I really am this happy! All the time! 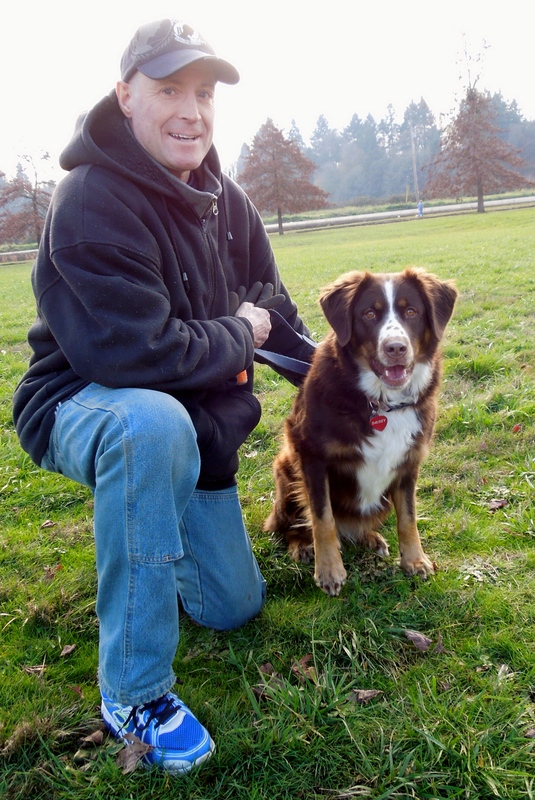 Meet Molly, a four-year-old Australian Shepherd/Australian Cattle Dog mix. This girl is always smiling! She has a lot of energy and would be a great jogging or hiking partner. 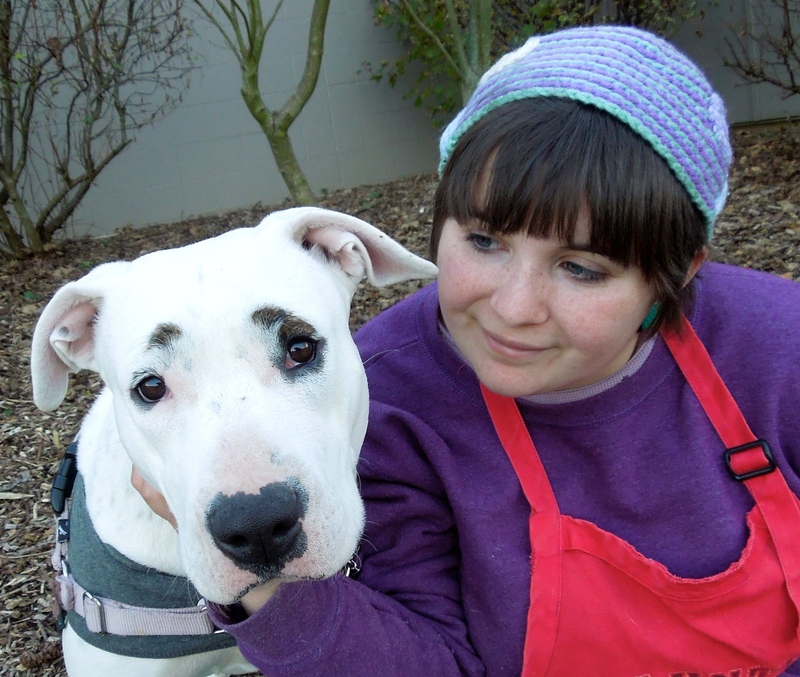 She has lived with kids before, but she is very lively, so would need dog-savvy youngsters. Wendy really enjoyed spending time with this eager young girl. Look at my face. Do I touch your heart? Some dogs I fall in love with at first look. Yep, Louise is one of those dogs. She is a California S.T.A.R.T. dog who is a one-year-old Pit Bull Terrier mix. Louise has come a long way since arriving at WHS a few days ago. At that time she trembled in her kennel and had to be coaxed to go outside. Each day she has become more trusting, and today she actually was sitting at the front of her kennel, tail wagging, hoping I’d brought treats. Although she is quite shy, she warms up quickly, as she did with Sarah on Sunday. 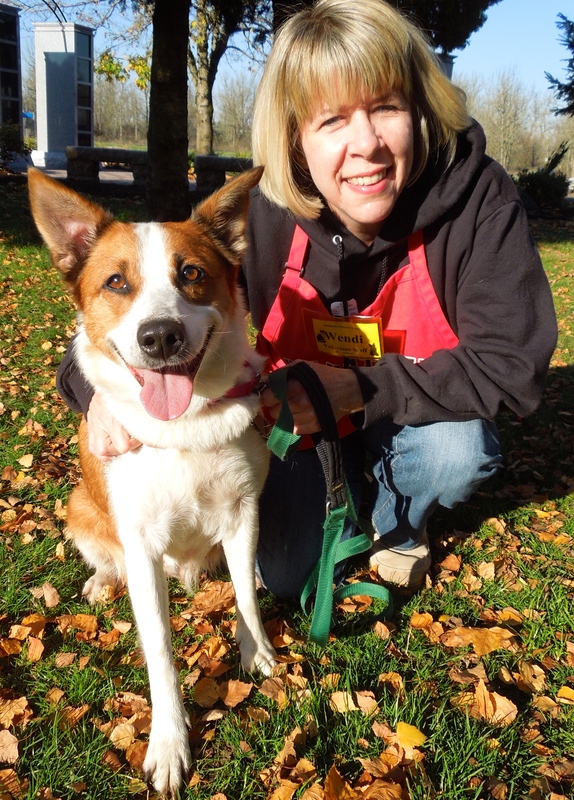 Her adoption includes a Shy Dog class to assist her new family learn how to help her gain more confidence. Yes, her eyes go straight to your heart. Hi! I’m another S.T.A.R.T. dog from California! 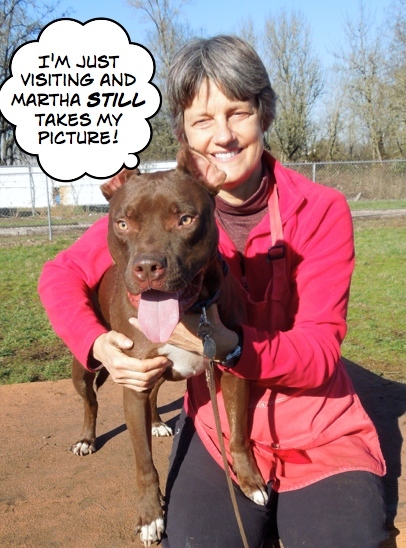 But now I’m an Oregon girl looking for a family to love! 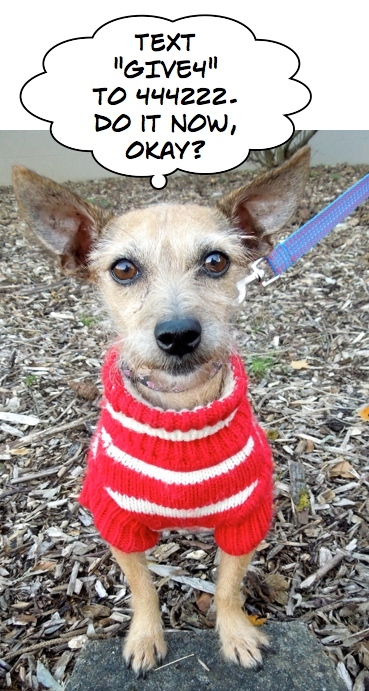 Daisey is a three-year-old Terrier mix who is absolutely adorable. Sarah and I both fell for her as soon as she posed for this picture. She is ten pounds, likes to romp, and loves attention. I have a feeling she’ll find her new people very quickly! I’m the new guy. My name is Bear. 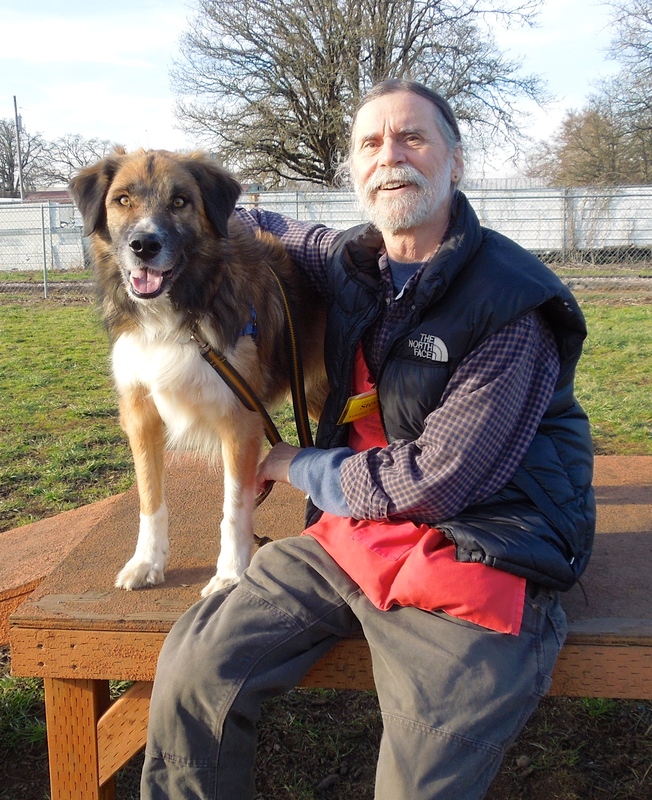 When I arrived at the shelter today, I was looking forward to meeting Bear, a six-year-old Australian Shepherd/Great Pyrenees mix. Steve spent time with him today and reported that Bear is anxious about being in the shelter. He will need a family who will be patient with him, as he is nervous around new things. He will also need active people since he will be quite energetic. Bear knows some commands and happily sat for my hot dog bits and enjoyed both Steve’s and my attention. He is a very handsome boy! I have to wear the dreaded cone. Does my face make you feel sorry for me? 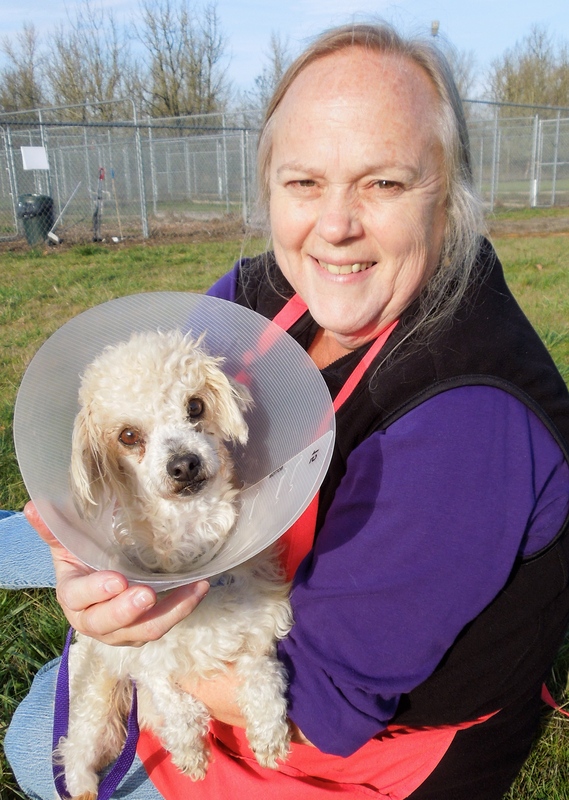 Poor little Alpaca is a three-year-old Poodle mix who also is a S.T.A.R.T. arrival. Having just been neutered, he has to wear a cone and he is not a bit happy about it. He was quite annoyed when a treat I tried to give him dropped into the cone and was unreachable for him. However, he enjoyed being in Joan’s lap, even with the cone. Alpaca would like a quiet home with a family who will give him lots of love. Do I really look like a baby seal? I think not! When I saw Taz in the puppy room today, I had to smile. What a cute little guy he is! Taz is a three-year-old Lhasa Apso mix. He is a little shy at first meeting, but he soon had Deb wrapped around his little paw. He is a little chunky, and would like to go for walks around the neighborhood to lose those few extra pounds. He does well with kids. What a cutie! I had to laugh when I saw Taz loving Debbie’s scratches. I have a new family! I’ll be going home soon! Meet Wizard, a one-year-old Terrier mix and another S.T.A.R.T. dog starting a new life. I was thrilled when one of my blog readers wrote to tell me they are adopting this little guy as soon as he is neutered. I hope to hear updates about him! 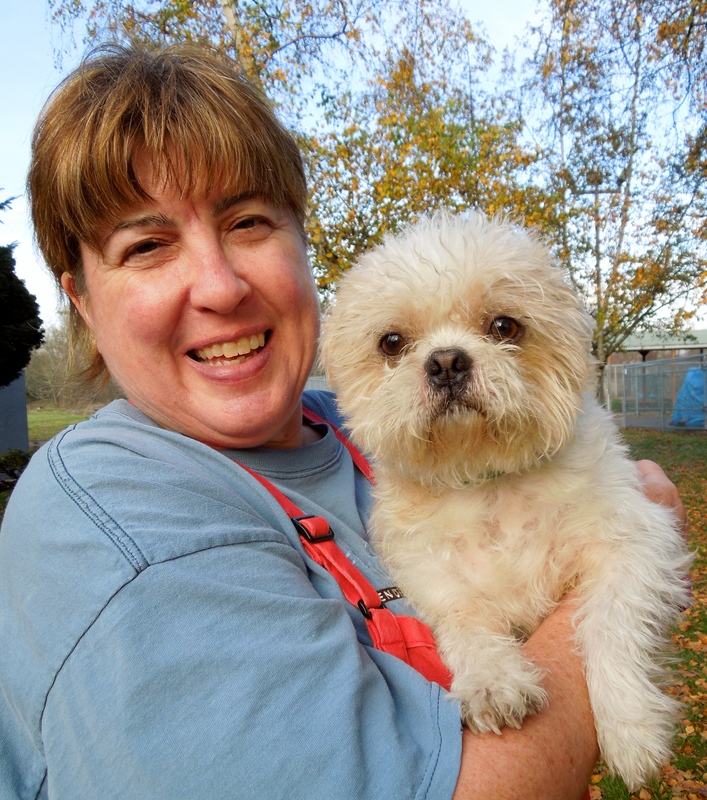 Here he is with Wendy soon after he arrived at WHS. 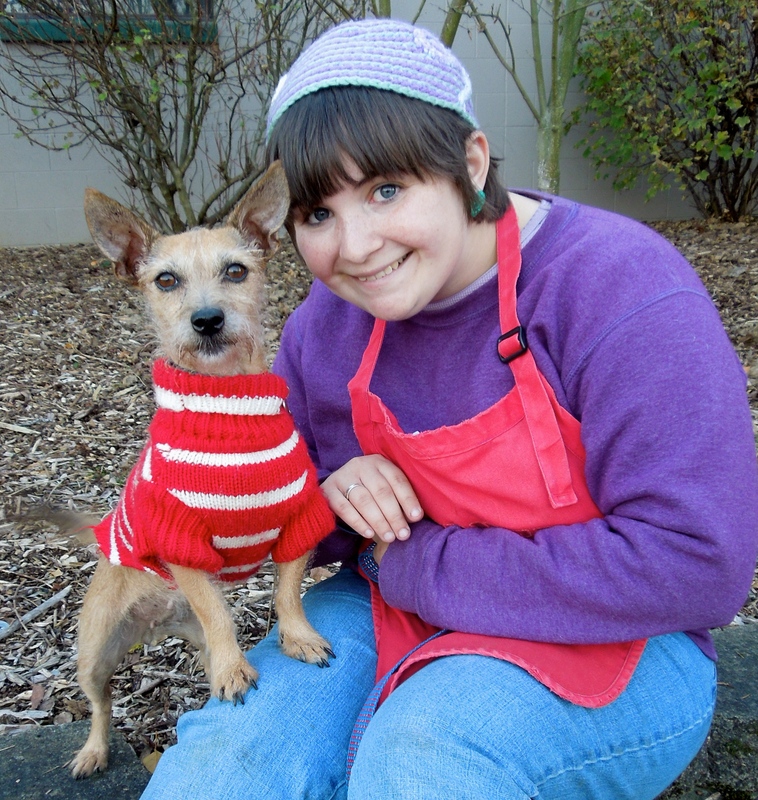 Wizard is a delightful little fellow and he has a wonderful life ahead of him! My name is Jump. I’d like to hop in your car and go home with you! 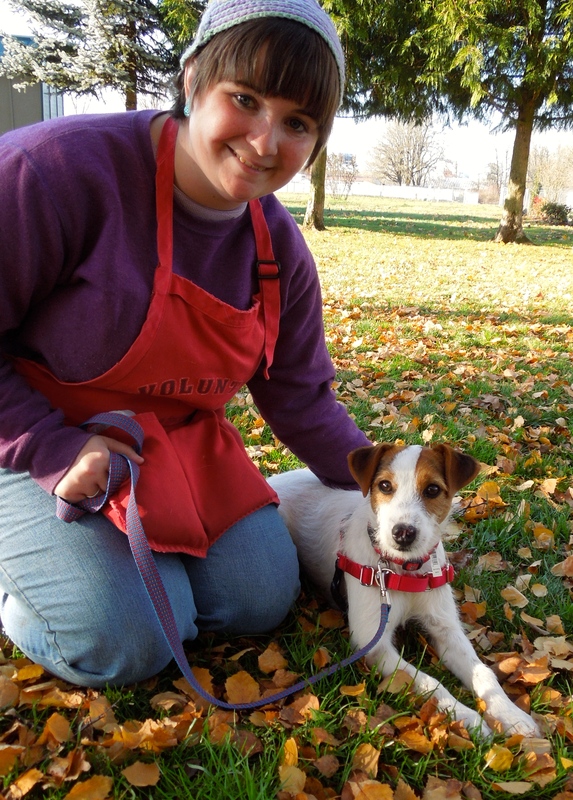 The last dog I want to introduce today is little Jump, a one-year-old Jack Russell Terrier mix. He came to us as a stray, so we don’t know much about him, but Sarah and I were amazed at his calm demeanor when we met him for the first time on Sunday. He loved my hot dog bits and took them gently. He knows some commands and enjoyed just sitting with us and visiting. 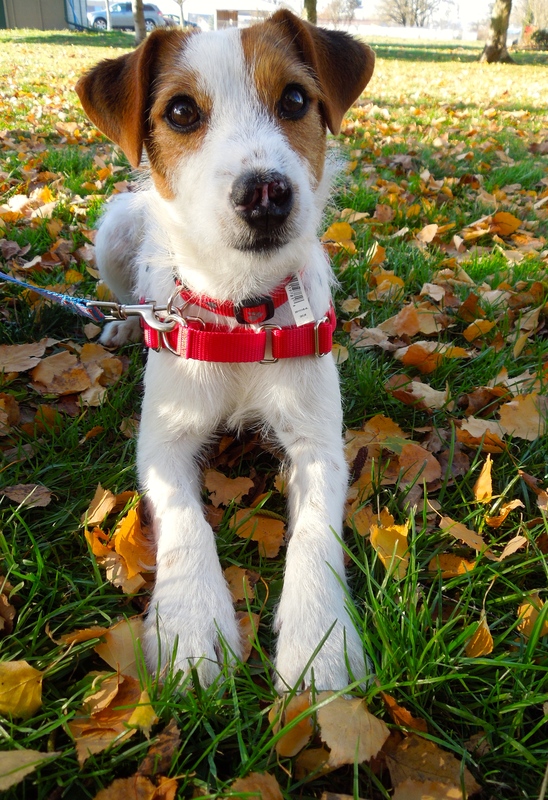 We’re hoping a Jack Russell person will see this little guy and take him home. Toward the end of my shift, I saw a man walking his dog. 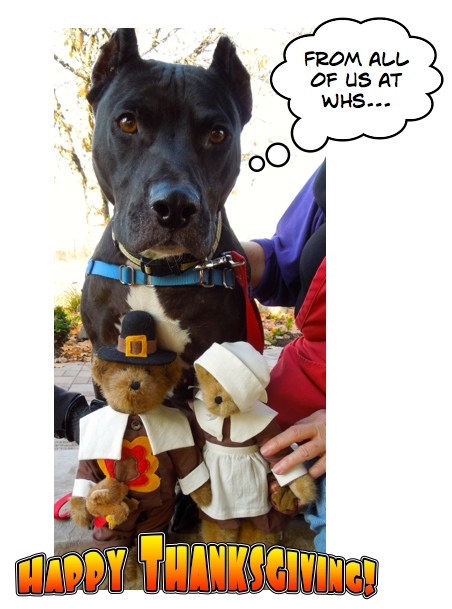 He wished me a Happy Thanksgiving, then introduced me to his dog, Daisey, whom he adopted from WHS in 2010. It was obvious that he loved Daisey very much. I asked if I could snap a picture for my blog and they happily agreed. 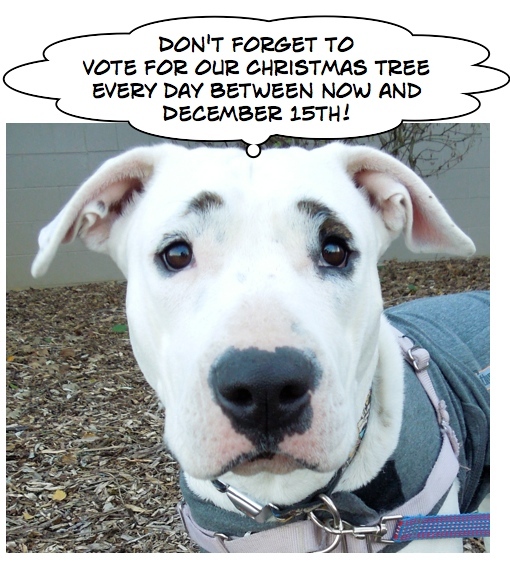 That’s it for this week…except for this reminder from our current Daisey. Another fabulous blog! I hope you have a Happy Thanksgiving! I didn’t see Louise when at the shelter today. I love those “eye brows”. We got all the dogs out for their Thanksgiving evening “poo” time and they got their extra treats from all of us. 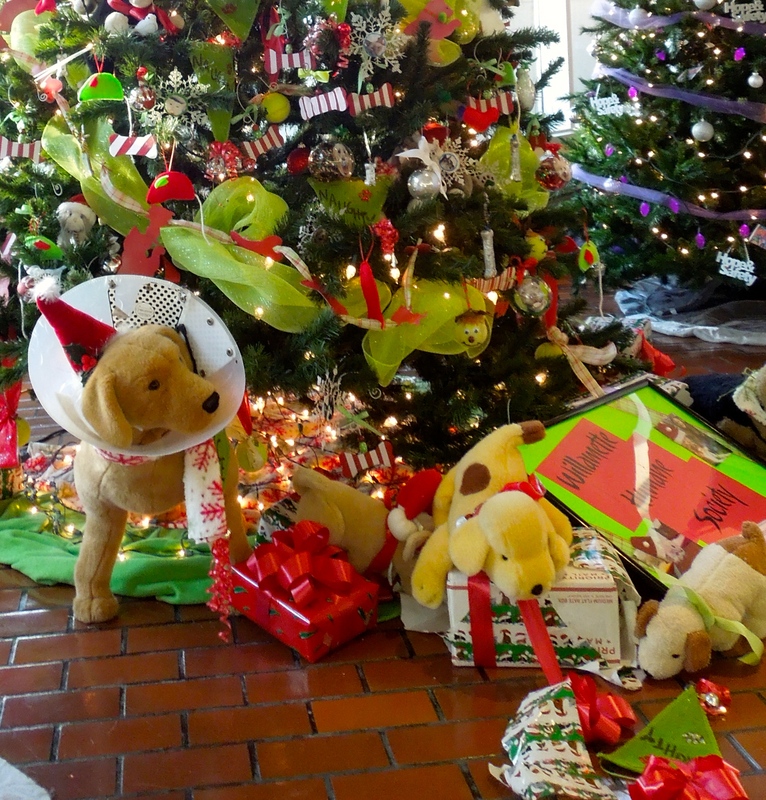 Your picture of the WHS tree turned out so much better than one I took. Have been voting every day. 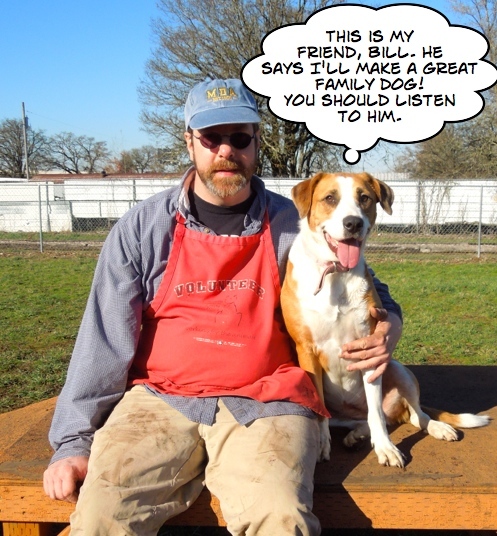 I am Thankful for your great blog, and how great you make the dogs look, and your great picture captions!